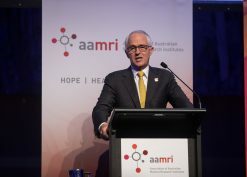 AAMRI was honoured to have the Prime Minister, the Hon Malcolm Turnbull MP, and the Health and Aged Care Minister, the Hon Sussan Ley MP, speak at our 2016 Annual Dinner at Parliament House in Canberra. Held shortly after Donald Trump was declared victorious in the US Presidential election, Prime Minister Turnbull was most gracious in speaking at the dinner before another engagement. 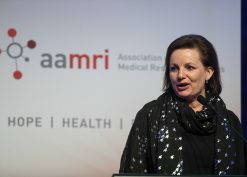 He touched on the Australian Medical Research and Innovation Priorities 2016-2018, with Minister Ley further elaborating in her speech later in the evening. 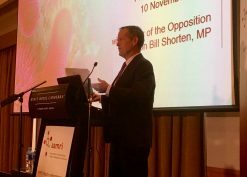 Opposition Leader, the Hon Bill Shorten MP, spoke at the 2016 AAMRI President’s Breakfast the next morning, saying he and Shadow Health Minister, the Hon Catherine King MP, were honoured to attend the Breakfast as they held medical research in such high regard. We thank the Prime Minister, the Health Minister and the Opposition Leader for being so generous with their time and their words in support of Australian medical research. Their full speeches can be viewed by clicking on the images below.